The name of an old, rich, and scholarly family of Narbonne, the numerous branches of which were found all over Spain and the Provence, as well as at various places in the Orient. It is still borne by certain families in Bulgaria, Servia, and Vienna. It was also used as a prænomen (see Steinschneider, "Cat. Bodl." No. 7348; Loeb, in "Rev. des Etudes Juives," xxi. 153). Statesman and chief rabbi (or "court rabbi") of Castile during the reign of Juan II., 1406-54. He was entrusted with the public finances, and, as he himself has stated, he controlled, in conjunction with the constable Alvaro de Luna, the entire administration of Castile. 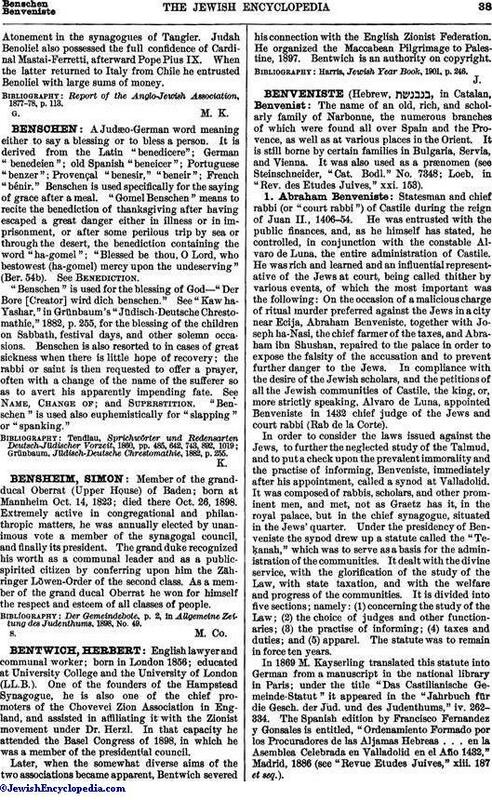 He was rich and learned and an influential representative of the Jews at court, being called thither by various events, of which the most important was the following: On the occasion of a malicious charge of ritual murder preferred against the Jews in a city near Ecija, Abraham Benveniste, together with Joseph ha-Nasi, the chief farmer of the taxes, and Abraham ibn Shushan, repaired to the palace in order to expose the falsity of the accusation and to prevent further danger to the Jews. In compliance with the desire of the Jewish scholars, and the petitions of all the Jewish communities of Castile, the king, or, more strictly speaking, Alvaro de Luna, appointed Benveniste in 1432 chief judge of the Jews and court rabbi (Rab de la Corte). In order to consider the laws issued against the Jews, to further the neglected study of the Talmud, and to put a check upon the prevalent immorality and the practise of informing, Benveniste, immediately after his appointment, called a synod at Valladolid. It was composed of rabbis, scholars, and other prominent men, and met, not as Graetz has it, in the royal palace, but in the chief synagogue, situated in the Jews' quarter. Under the presidency of Benveniste the synod drew up a statute called the "Teḳanah," which was to serve as a basis for the administration of the communities. It dealt with the divine service, with the glorification of the study of the Law, with state taxation, and with the welfare and progress of the communities. It is divided into five sections; namely: (1) concerning the study of the Law; (2) the choice of judges and other functionaries; (3) the practise of informing; (4) taxes and duties; and (5) apparel. The statute was to remain in force ten years. In 1869 M. Kayserling translated this statute into German from a manuscript in the national library in Paris; under the title "Das Castilianische Gemeinde-Statut" it appeared in the "Jahrbuch für die Gesch. der Jud. und des Judenthums," iv. 262-334. The Spanish edition by Francisco Fernandez y Gonsales is entitled, "Ordenamiento Formado por los Procuradores de las Aljamas Hebreas . . . en la Asemblea Celebrada en Valladolid en el Año 1432," Madrid, 1886 (see "Revue Etudes Juives," xiii. 187 et seq.). Abraham is renowned for having reinstated the study of the Law and for having, by his liberality, kept many Jews from conversion. Grätz, Gesch. der Juden, 3d ed., viii. 141 et seq., 417 et seq. A scholar known also as "Abraham Benveniste the Elder," to distinguish him from his grandson of the same name. He was born in 1433, in Soria, province of Caceres, Spain, and at his circumcision Joseph Albo made a speech. Together with his elder brother Vidal, he furthered the study of the Law and encouraged Jewish scholars by his support. Grätz, Gesch. der Juden, 3d ed., viii. 417 et seq. Rabbi of Salonica in 1550; mentioned as a rabbinical scholar by his contemporaries (Conforte, "Ḳore ha-Dorot," p. 38a). Benveniste was a man of astonishing learning. At the age of twenty-one he had already begun his commentary to the "Semag" ("Sefer ha-Miẓwot") of Moses de Coucy. This was followed by the notable work "Keneset ha-Gedolah," a commentary in eight parts on the four codes of the Law, of which the following were published during the lifetime of the author: "Oraḥ Ḥayyim" (Leghorn, 1657) and "Sheyare" (=Addenda), ib. 1671; 2d ed., Constantinople, 1729; both included in 2d ed., Leghorn, 1791-92; "Ḥoshen Mishpaṭ," Smyrna, 1660; 2d ed. in two parts, ib. 1734). The remaining portions of the work were published, 1711, 1716, 1717, 1731, in Constantinople, where the "Dine de-Ḥayye" (Laws of the Living), or commentary on the work of Moses de Coucy, also appeared in two parts, 1742. The responsa of Benveniste were published at Constantinople in 1743, and another collection of them, dealing with the "Yoreh De'ah" and the "Eben ha-'Ezer," appeared in four parts under the title "Ba'e Ḥayye" (Necessaries of the Living) at Salonica, 1788-91. In addition to these there exist "Pesaḥ Me'ubbin," prayers and rites for the first two evenings of Passover; an extract from the "Keneset ha-Gedolah," Venice, 1692; and "Ḥamra we-Ḥayye" (Wine and Life), on the Babylonian treatise Sanhedrin, Leghorn, 1802. Michael, Or ha-Ḥayyim, No. 862. Noted printer and publisher in Amsterdam from 1640 to 1660. He published several rituals and larger works, among which may be mentioned "'Aruk," "Shulḥan 'Aruk," "Sh'ne Luḥot ha-Berit," and a valuable complete and still popular edition of the Talmud. The last named, owing to a lack of purchasers, was offered for sale, soon after publication, at six imperials or less. From his workshop issued several well-known printers, notably the firm of Judah Gumpel and Samuel Levi, as well as Uri Phœbus Levi. 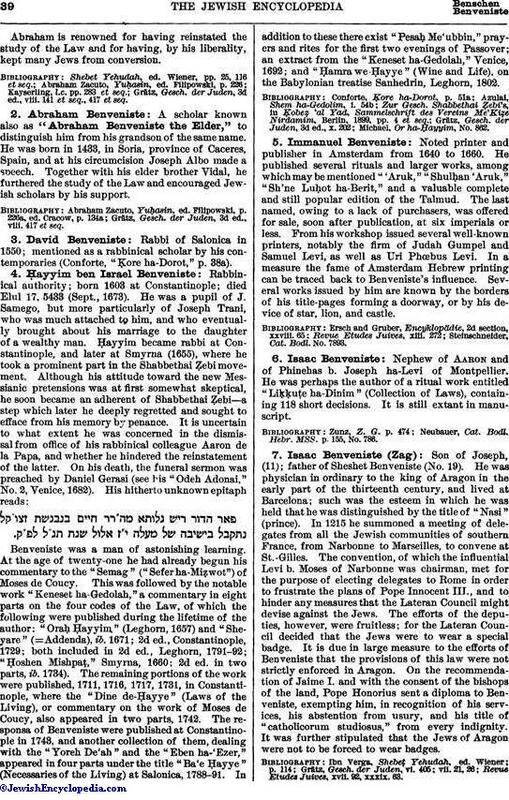 In a measure the fame of Amsterdam Hebrew printing can be traced back to Benveniste's influence. Several works issued by him are known by the borders of his title-pages forming a doorway, or by his device of star, lion, and castle. Steinschneider, Cat. Bodl. No. 7893. Nephew of Aaron and of Phinehas b. Joseph ha-Levi of Montpellier. He was perhaps the author of a ritual work entitled "Liḳḳuṭe ha-Dinim" (Collection of Laws), containing 118 short decisions. It is still extant in manuscript. Neubauer, Cat. Bodl. Hebr. MSS. p. 155, No. 786. 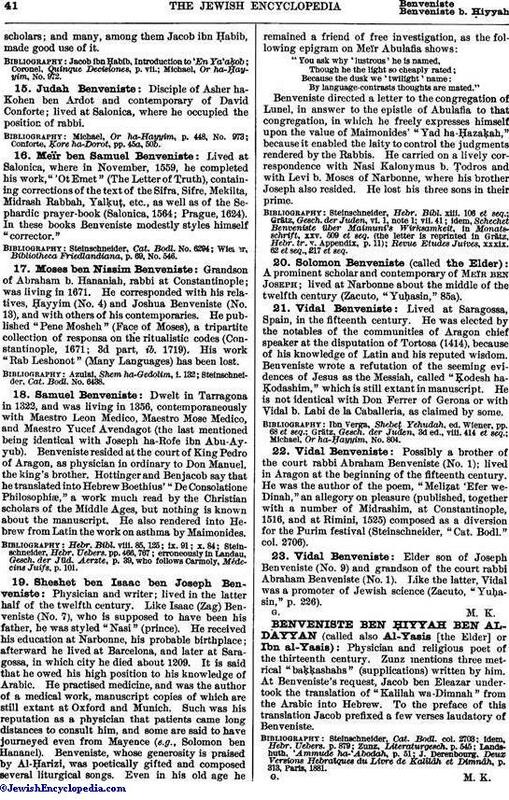 Son of Joseph, (11); father of Sheshet Benveniste (No. 19). He was physician in ordinary to the king of Aragon in the early part of the thirteenth century, and lived at Barcelona; such was the esteem in which he was held that he was distinguished by the title of "Nasi" (prince). In 1215 he summoned a meeting of delegates from all the Jewish communities of southern France, from Narbonne to Marseilles, to convene at St.-Gilles. The convention, of which the influential Levi b. Moses of Narbonne was chairman, met for the purpose of electing delegates to Rome in order to frustrate the plans of Pope Innocent III., and to hinder any measures that the Lateran Council might devise against the Jews. The efforts of the deputies, however, were fruitless; for the Lateran Council decided that the Jews were to wear a special badge. It is due in large measure to the efforts of Benveniste that the provisions of this law were not strictly enforced in Aragon. On the recommendation of Jaime I. and with the consent of the bishops of the land, Pope Honorius sent a diploma to Benveniste, exempting him, in recognition of his services, his abstention from usury, and his title of "catholicorum studiosus," from every indignity. It was further stipulated that the Jews of Aragon were not to be forced to wear badges. Revue Etudes Juives, xvii. 92, xxxix. 63. Relative of Ḥayyim (No. 4) and of Joshua ben Israel Benveniste (No. 13); a resident of Constantinople; died 1677. He wrote "Bet Yisrael" (House of Israel), a collection of sermons and funeral orations, published by his son (Constantinople, 1678; Azulai, "Shem ha-Gedolim," ii. 46). Son of the court rabbi Abraham Benveniste (No. 1); lived in Castile in 1450; and is said to have been wealthy, philanthropic, and a patron of Jewish science (Zacuto, "Yuḥasin," p. 226). Of Segovia; lived in Smyrna toward the end of the sixteenth century; son of Moses Benveniste, and disciple of Elias Galigo and of Samuel Useda. Of his writings nothing remains but a fragment on the Talmudic treatise Giṭṭin, published by his grandson Solomon Algazi in the work entitled "Dobeb Sifte Yeshenim" (causing the lips of those that are asleep to speak, Cant. vii. 10), Smyrna, 1671. Benjacob, Oẓar ha-Sefarim, p. 108, No. 169. Grandson of Zerahiah Gerundi, and grandfather of Aaron ben Joseph ha-Levi; lived about 1190 at Montpellier (Gross, "Gallia Judaica," pp. 330 et seq.). Castilian minister of finance, and councilor of Alfonso XI. ; born at Ecija at the end of the thirteenth century; died at Toledo in 1337. The Infante Don Philip being captivated by Benveniste's great abilities, pleasing manners, and talent for music, recommended him to his nephew Alfonso XI. The latter, not less charmed than his uncle, appointed Benveniste not only minister of finance (almoxarif), but also confidential councilor (privado). Benveniste's position was a very influential one. He rode out in a state carriage, knights escorted him on his journeys, and grandees dined at his table. This greatness could not fail to excite envy; and Benveniste had to struggle against the plots of his enemies, under whose attacks he finally fell. As a token of his confidence, Alfonso sent him to Valladolid to bring his sister, Doña Leonora, to Toledo (1328). When the Infante was about to set out, a mob, instigated by Benveniste's enemies, attempted to kill him and his attendants. His life was saved by the princess. She asked the leaders to let him accompany her to the Alcazar of the city, where she promised to give him up. But, when there, she ordered the gates to be shut and refused to deliver him to the rioters. Alfonso on learning what had happened marched against Valladolid, besieged it, burned many houses, and would have destroyed it entirely, had not more moderate persons dissuaded him. The plot having failed, Benveniste's enemies had recourse to slander. Many complaints against his administration were made to the Cortes of Valladolid; and the king, fatigued at last by these constant complaints, dismissed Benveniste from the council and the position of almoxarif. Benveniste's downfall was, to some extent, due to himself. Samuel ibn Wakar, Alfonso's physician, stood high in the royal favor. Alfonso entrusted him with the farming of the revenues derived from the importation of goods from the kingdom of Granada. Benveniste, jealous of his coreligionist's influence, offered a higher sum for the right of farming the import taxes. Samuel, in order to avenge himself, privately persuaded the king to stop the exportations by the Moors, regardless of existing treaties. This was followed by a war with the Moors. Alfonso's treasury being exhausted, Gonzalo Martinez, who had served under Benveniste and had become influential through his recommendation, proposed to buy from the king ten of the principal Jews, for whom he would pay 800 lb. of silver. The king, compelled by his need of money, consented; and Martinez hastened to seize his former benefactor and to throw him into prison, where he died. Grätz, Gesch. der Juden, 3d ed., vii. 266 et seq. Rabbi in Constantinople toward the end of the seventeenth century; brother of Ḥayyim Benveniste (No. 4), and, like the latter, a disciple of Joseph Trani. He was a physician and rabbi at Constantinople in 1660, and was the author of the following works: "Ozne Yehoshua'" (The Ears of Joshua), sermons for the Sabbath and special occasions (Constantinople, 1677); "Sedeh Yehoshua'" (Field of Joshua), a commentary on several tracts of the Talmud Yerushalmi (ib. 1662, 1749); "'Abodah Tammah" (Perfect Service), a commentary on the 'Abodah for the Day of Atonement (ib. 1719-20); "Seder ha-Geṭ," on the formula for divorce, written at Brusa and published at Constantinople, 1719. 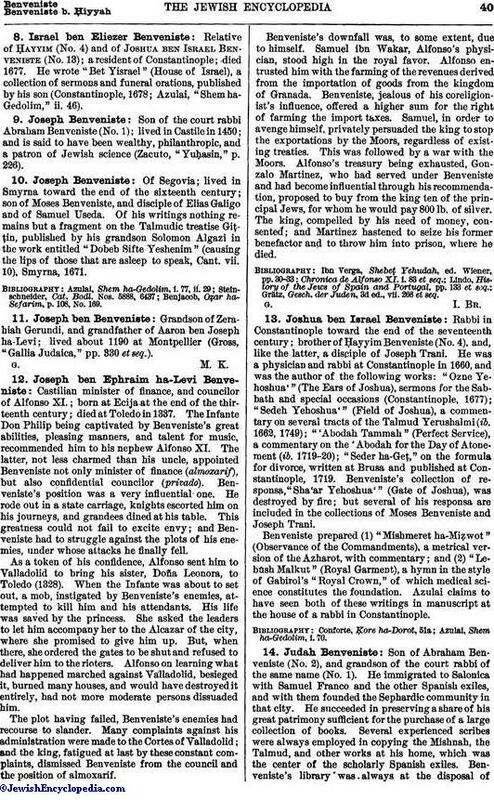 Benveniste's collection of responsa, "Sha'ar Yehoshua'" (Gate of Joshua), was destroyed by fire; but several of his responsa are included in the collections of Moses Benveniste and Joseph Trani. Benveniste prepared (1) "Mishmeret ha-Miẓwot" (Observance of the Commandments), a metrical version of the Azharot, with commentary; and (2) "Lebush Malkut" (Royal Garment), a hymn in the style of Gabirol's "Royal Crown," of which medical science constitutes the foundation. Azulai claims to have seen both of these writings in manuscript at the house of a rabbi in Constantinople. Azulai, Shem ha-Gedolim, i. 70. Son of Abraham Benveniste (No. 2), and grandson of the court rabbi of the same name (No. 1). He immigrated to Salonica with Samuel Franco and the other Spanish exiles, and with them founded the Sephardic community in that city. He succeeded in preserving a share of his great patrimony sufficient for the purchase of a large collection of books. Several experienced scribes were always employed in copying the Mishnah, the Talmud, and other works at his home, which was the center of the scholarly Spanish exiles. Benveniste's library was always at the disposal ofscholars; and many, among them Jacob ibn Ḥabib, made good use of it. Michael, Or ha-Ḥayyim, No. 972. Disciple of Asher ha-Kohen ben Ardot and contemporary of David Conforte; lived at Salonica, where he occupied the position of rabbi. Conforte, Ḳore ha-Dorot, pp. 45a, 50b. Lived at Salonica, where in November, 1559, he completed his work, "'Ot Emet" (The Letter of Truth), containing corrections of the text of the Sifra, Sifre, Mekilta, Midrash Rabbah, Yalḳuṭ, etc., as well as of the Sephardic prayer-book (Salonica, 1564; Prague, 1624). In these books Benveniste modestly styles himself "corrector." Wiener, Bibliotheca Friedlandiana, p. 69, No. 546. Grandson of Abraham b. Hananiah, rabbi at Constantinople; was living in 1671. He corresponded with his relatives, Ḥayyim (No. 4) and Joshua Benveniste (No. 13), and with others of his contemporaries. He published "Pene Mosheh" (Face of Moses), a tripartite collection of responsa on the ritualistic codes (Constantinople, 1671; 3d part, ib. 1719). His work "Rab Leshonot" (Many Languages) has been lost. Steinschneider, Cat. Bodl. No. 6438. Dwelt in Tarragona in 1322, and was living in 1356, contemporaneously with Maestro Leon Medico, Maestro Mose Medico, and Maestro Yuçef Avendagot (the last mentioned being identical with Joseph ha-Rofe ibn Abu-Ayyub). Benveniste resided at the court of King Pedro of Aragon, as physician in ordinary to Don Manuel, the king's brother. Hottinger and Benjacob say that he translated into Hebrew Boethius' "De Consolatione Philosophæ," a work much read by the Christian scholars of the Middle Ages, but nothing is known about the manuscript. He also rendered into Hebrew from Latin the work on asthma by Maimonides. erroneously in Landau, Gesch. der Jüd. Aerzte, p. 39, who follows Carmoly, Médecins Juifs, p. 101. "You ask why 'lustrous' he is named, Though he the light so cheaply rated; Because the dusk we 'twilight' name: By language-contrasts thoughts are mated." Benveniste directed a letter to the congregation of Lunel, in answer to the epistle of Abulafia to that congregation, in which he freely expresses himself upon the value of Maimonides' "Yad ha-Ḥazaḳah," because it enabled the laity to control the judgments rendered by the Rabbis. He carried on a lively correspondence with Nasi Kalonymus b. Ṭodros and with Levi b. Moses of Narbonne, where his brother Joseph also resided. He lost his three sons in their prime. Revue. Etudes Juives, xxxix. 62 et seq., 217 et seq. A prominent scholar and contemporary of Meïr Ben Joseph; lived at Narbonne about the middle of the twelfth century (Zacuto, "Yuḥasin," 85a). Lived at Saragossa, Spain, in the fifteenth century. He was elected by the notables of the communities of Aragon chief speaker at the disputation of Tortosa (1414), because of his knowledge of Latin and his reputed wisdom. Benveniste wrote a refutation of the seeming evidences of Jesus as the Messiah, called "Ḳodesh ha-Ḳodashim," which is still extant in manuscript. He is not identical with Don Ferrer of Gerona or with Vidal b. Labi de la Caballeria, as claimed by some. Michael, Or ha-Ḥayyim, No. 804. Possibly a brother of the court rabbi Abraham Benveniste (No. 1); lived in Aragon at the beginning of the fifteenth century. He was the author of the poem, "Meliẓat 'Efer we-Dinah," an allegory on pleasure (published, together with a number of Midrashim, at Constantinople, 1516, and at Rimini, 1525) composed as a diversion for the Purim festival (Steinschneider, "Cat. Bodl." col. 2706). Elder son of Joseph Benveniste (No. 9) and grandson of the court rabbi Abraham Benveniste (No. 1). Like the latter, Vidal was a promoter of Jewish science (Zacuto, "Yuḥasin," p. 226).